I've always been extremely fascinated by examples of photographic oddities of all kind; everything from Victorian mortuary photography to Ted-Serios-style thoughtographs. I might even say it's the photography centered phenomena that strike me as the most compelling—at least in the sense that they seem to be the stories that have haunted me, stayed with me. I recall hearing a Nevada atom bomb test witness describe his experience of taking cover deep in a ditch, and with his hands over his closed eyes, being able to see the bones of his fingers. While browsing in a bookstore, I read a paragraph or so about anomalous photographic-style landscape imagery found on the innards of sheep. I spent years hoping to come across that story again, and finally found it recently. It is thought that lightning might be responsible for the imagery. Within the highly controversial esoteric health modality called radiesthesia (or, radionics) there are very intriguing and mysterious photographic images. In the mid 1930s, chiropractor Dr. Ruth Drown allegedly produced X-ray/CAT scan-style images of various anatomical structures—organs, tissues, etc.--using a camera-like device of her own creation (the rather hilariously named "Homo Vibra Ray") based upon the assumptions of radionics, that is, universal energy fields, vibrations, etc. Although there were apparently many photographs taken with the Homo Vibra Ray, and many published, I could locate only one of the images on the internet—that of an abscessed tooth. It's striking. How exactly did Drown produce this cross-sectional image not only without the use of X-ray equipment, a CAT scan, (technology which would come 40 years later) but without the use of even electricity or a light source? "Dr. Drown was able to "tune in" on the abcessed part of the tooth using the Drown Homo-Vibra-Ray Diagnostic Instrument and a dried drop of blood (a blood 'crystal') from the patient. Patients were usually many miles away from Dr. Drown's office at the time she made her diagnosis and Radio-Vision photographs. They didn't need to be there because all of the patient's etheric vibratory 'signatures' are captured within the blood crystal …she could have tuned in on any part of this patient's body and discovered diseased organs or pathogenic organisms anywhere in the body by merely changing the dials on her diagnostic instrument and changing the vibratory tuning "rates." "I wanted to put her to a test. I was at that time having a toothache. So I asked her if she would diagnose my condition and take a photograph. But I didn't tell her anything. And she took these photographs that were about eight by ten. It looked like a very detailed picture of teeth. She put the film in this box, but there were no lenses or anything like that. Whatever this radiation was, it exposed the film. It was not done with light. And she got a photograph of the tooth. Being scientific in nature, I said, "Now do it again." This was all in the dark. She couldn't see me. So I pressed the tooth hard with my finger to make it hurt more, to see what would happen. 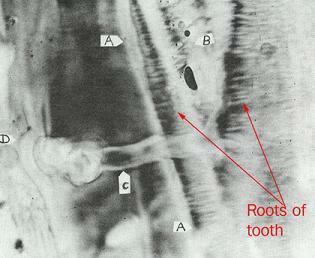 The next picture was an enlargement of this same tooth." Not surprisingly, the consensus is that Drown was a fraud. Be that as it may, her strange, detailed, anachronistic images exist. I have not yet found any debunking or skeptical themed literature that specifically addresses those images. It strikes me as somewhat akin to the known-to-be-fradulent Spiritualism-era mediums producing obviously "fake" manifestations and phenomena despite the most insanely rigorous environmental and physical constrictions and restrictions. So, if phenomena is produced under impossible conditions, what exactly is to be measured—the product or the production? I generally like to take a kind of Gestalt stance with such questions and "problems" but, in Drown's case, I say a measurement of the product—the images—is in order. It might be illuminating for modern researchers to take on a forensic investigation of any original samples to see if any information can be gleaned about the methods, light sources, equipment, etc. Inevitably, within topics and events of spirit, energy, esoterica, (or whatever name one wishes to attach) there seems to always be a sense of Tricksterlike reflexivity and liminality--a blurring of boundaries between poles of truth and fiction, real and unreal. The intrigue of photographic-centered mysteries and esoterica may be that the nature of photography itself poses those same dilemmas, occupies a similar space of blurred borders.